Comments Off on Ukkari juuban! The DGS Hibiki comic was so popular that they had to reiprint it! Ukkari juuban! (Careless second printing) OnoD says it wasn’t ukkari (careless), though, and that they’re reprinting it because it sold well. …Yes, the only difference between these two are the obis. Mosu! This is the live DVD for the Original Entertainment Paradise (aka OrePara) concert held on December 28, 2008, presented by Lantis. It featured Morikubo Shoutarou, Ono Daisuke, Suzumura Kenichi, and Iwata Mitsuo. Since this is a DGS fansite, I’ll just cover OnoD’s portion. Ono’s set list comprised of Prism, Sora, Amaoto, Diamond Dust, and Manatsu no Spica. At the time of this live, Diamond Dust was a new song since Kazahana hadn’t been released yet. The set was excellent. Personally, these are some of my favorite songs by Ono so I really enjoyed seeing them sung live. He opened with two songs and then had a little introduction segment. I like when he sings Amaoto live because he gets so into it that it looks like he’s going to cry. During the short break between Amaoto and Diamond Dust, he had to take a drink of water and the audience yelled out “kawaii,” to which Ono replied with HiroC’s line, “Kawaii tte iu na yo (Don’t call me cute),” and then continued to drink his water with a straight face, haha. Of course this made the audience say it even more and then he admitted, “But now that I’ve reached 30 [years old], I’m kind of happy when people say I’m cute.” Haha! OnoD, kawaii~! OnoD sings very well live, and he knows how to get the crowd into it. At the end there was an encore with all four artists singing Nemuru Monotachi he, which is a song on Iwata’s mini-album CORE. They got the audience into it and had them sing the lines “bokura umaretekita yo” and “itsuka waraiau tame ni.” When they were calling everyone out, Ono was about to get started without SuzuKen who was still offstage. SuzuKen came out with an “Ono hidoi yo~ (Ono, how mean! )” Oops! .^^; They then compared each other’s tshirts and totally ignored Ono’s “もす。(Mosu. )” shirt, haha. The making movie on the second disc was fun. OnoD was really nervous. It’s amazing that these guys can stand in front of hundreds, or even thousands, of people and sing and talk. It certainly takes a lot of guts. At they end, they showed a bunch of fans yelling out “OrePara saikou!” and stuff, and there was even a group of guys! Haha. One of them had a Mosu. shirt on and another even had a DGS shirt (OnoD white)! A Dear Boy!!! Actually at the beginning of the live after they had gone through introductions, Iwata called out to all the guys in the crowd and noticed the guy with the Mosu. shirt and yelled at him, “‘The hell you wearin’ a Mosu. tshirt for!? Wear mine! !” Ono laughed and bowed and thanked, hehe. Overall, an entertaining DVD though perhaps a little pricey if you just want it for OnoD. 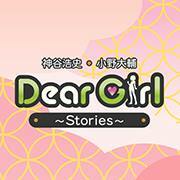 Dear Girl ~Stories~ Hibiki vol.1. The first volume of Dear Girl ~Stories~ Hibiki includes the first two chapters of the comic, a bunch of 4koma comics, a novel written by Suwa sensei, as well as Hato sensei’s DGS report manga, a photo comic, and goods catalog. The first chapter was first published in the DGS Fanbook. HiroC and OnoD are given a mission to make-over a yankee girl so she can have the courage to confess to Narazuka senpai, the student body president. In the second chapter, a girl named Yuki loves playing guitar and wants to become a music artist but her mother doesn’t consent to it. HiroC and OnoD help her take steps to realize her dream. The 4koma shorts are based on material from the radio show, and I have yet to read the novel or Hato sensei’s report manga. The photo comic has photos from DGS recordings related to how the comic and novel projects came about with dialogue bubbles. Lastly, the goods catalog is just that, a showcase of the DGS goods produced. Overall, this is a must-have for all DGS fans. The manga is really funny and Iwasaki sensei’s illustrations are adorable! Since the 4koma comics are based on material from the radio show, anyone who doesn’t listen to DGS probably wouldn’t get it but if you do, it’s quite hilarious. The obi is pretty cute with messages from Kamiya and Ono. Kamiya: “Ono kun said something good!” Ono: “Already a best seller!” What’s funny about it is that Kamiya wrote his message before Ono, haha.